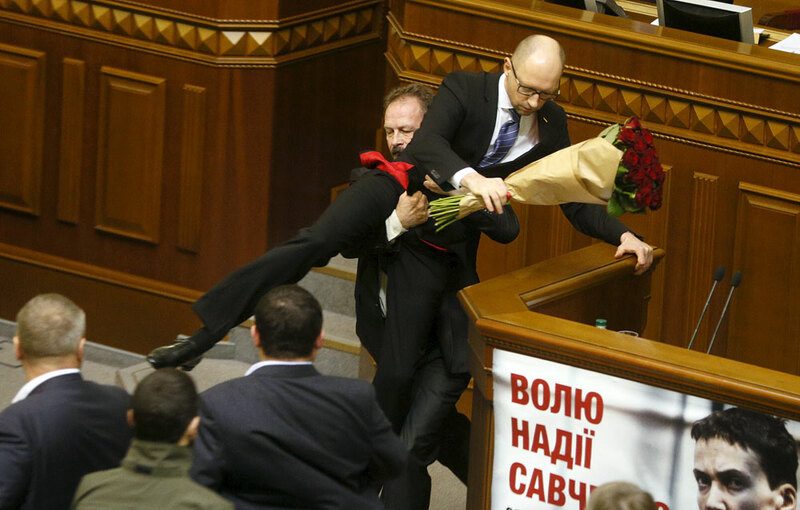 Rada deputy Oleg Barna removes Prime Minister Arseny Yatseniuk from the tribune, after presenting him a bouquet of roses, during the parliament session in Kiev, Ukraine, 2015. There are signs that the political turmoil in Ukraine could pose an increasing threat to Russia’s efforts to resolve the crisis and stabilize its own political and economic interests. Ukraine may be about to enter a new phase of political turmoil. Prime Minister Arseniy Yatsenyuk's possible resignation, the collapse of the coalition, and early elections would be bound to affect relations between Russia and Ukraine and Russian interests. This turn in Ukraine's political troubles coincides with the crisis surrounding Russian freight transport in the country. Activists from Ukrainian radical groups have been blockading Russian trucks transiting through Ukraine. In response, Russia's Ministry of Transport has banned Ukrainian trucks from Russia. Ukraine has since announced a temporary suspension of transit journeys across the country by trucks registered in Russia. The situation is further damaging Russia's economic ties with Europe, already suffering because of the sanctions against Moscow. Analysts indicate that the situation will further deteriorate if the political crisis in Kiev gets worse. According to Vladimir Yevseyev of the Institute of CIS Countries, it will soon "be necessary to move from a deterioration of bilateral economic relations right up to the maximum possible breakdown of economic ties." However, despite the anti-Russian sentiment in Ukraine, new waves of Ukrainian labour migrants are expected to arrive in Russia. According to Mikhail Pogrebinsky, director of the Kiev-based Centre for Political Studies and Conflict Management, this will happen if the socio-economic situation in Ukraine deteriorates against the backdrop of the current political confusion. "Russia may face a flood of refugees that it will find hard to cope with because of its own economic problems," said the Ukrainian analyst. Political instability in Ukraine will make it even harder, if not impossible, for the country to implement the Minsk agreements aimed at resolving the conflict in the Donbass region. The West has made the lifting of the sanctions against Russia contingent on the implementation of Minsk II. However, analysts note that even under more favourable political circumstances, Kiev has been unable to take serious steps towards moving on the Minsk accords. The ambiguous amendments to Ukraine’s Constitution, outlined in the peace agreements, have been awaiting final ratification since last August. The Minsk accords are unlikely to be implemented in the near future either, analysts opine. "To implement the Minsk agreements Kiev needs to start talking directly with Donetsk and Luhansk," said Yevseyev. Given these circumstances, chances of the sanctions against Russia being lifted appear remote any time soon. Among the consequences of the political crisis and the stalling on implementing the Minsk agreements could be a renewal of fighting in the Donbass region. Such a scenario cannot be ruled out should nationalist radicals come to power in Kiev, believes Pogrebinsky. A renewal of fighting would bring further pressure from the West on Moscow, including economically, as well as new expenses on supporting the inhabitants of the insurgent Ukrainian regions. However, analysts are divided over such critical scenarios will happen; events are more likely to pan out less dramatically. The coalition in the Rada will survive whether or not Yatsenyuk remains prime minister, and if it is unclear if early parliamentary elections will take place, and if so, when. Whoever the prime minister will be, "there are no grounds to believe that [under him] the Ukrainian government will be favourable to Russia," believes Pavel Svyatenkov, with the independent National Strategy Institute. Ukraine, even without any major upheaval, will continue to be a source of tension for its northern neighbor.